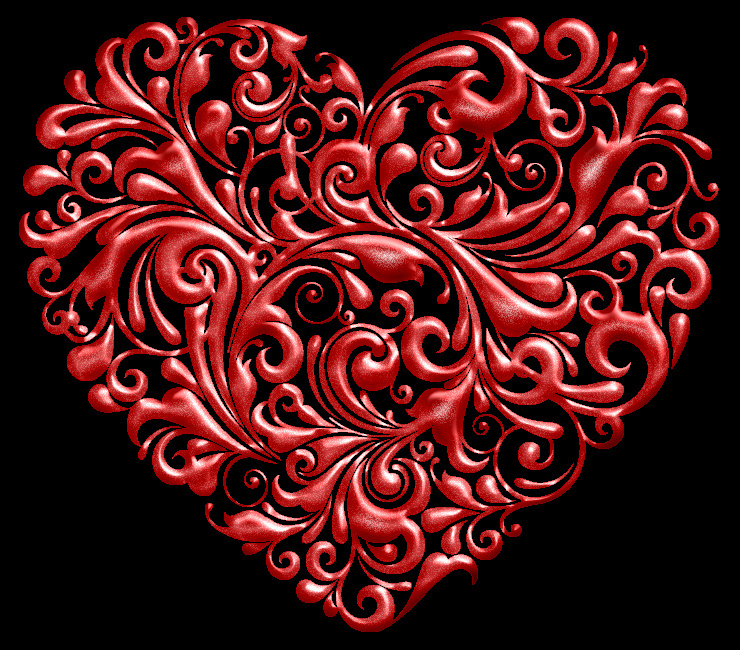 New blog entries feature people with a passion! No, this is not a ploy on my part to get web-surfers to look at my blog. I am, however, using the word "passion" on purpose. 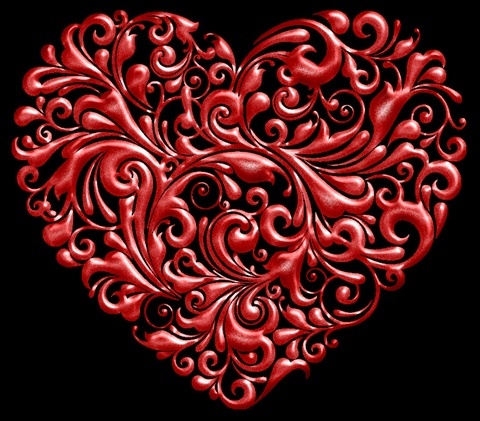 I have noticed lately that I am very lucky to know several interesting people who are driven to do exceptional things. These people are a diverse group, and I hope that I can continue to be inspired by them and meet many more. My goal is to introduce these people to you. Hopefully you will find them as interesting and inspirational as I have. Perhaps you will like something they make or be interested in their ideas or a group or organization they support. Maybe you will be inspired to do what they do. Most likely reading about them will enrich you and give you ideas about how you can add more "passion" to your life. It would be so great if you could comment or "like" these pages. It will show those persons featured that you support them and likewise show me that readers are enjoying this new line of entries. Continue reading to meet these passionate people! Emily - Cooking, blogging and growing-up one bite at a time. Emily and her sous chef, Bells. I spent some quality time with Emily Barnes and her family a few years ago when they came to Portland for her cousin's wedding. I hadn't seen Emily since we lived in Ann Arbor, Michigan, in the 90's, when Emily was a childhood friend of my children. She and her family lived by us in a wonderful cul-de-sac. My memories of Emily during that time primarily consist of a darling, independent force of nature who enjoyed driving her little pink battery- powered car around the neighborgood and did lots of things that included glitter. I was so happy to spend some time with her the day before the wedding, and to see the creative and interesting person that she has grown into. During our visit, I learned that Emily, while studying creative writing and psychology at Eastern Michigan University, worked in restaurant kitchens, including The Ravens Club where she became the Garde Manger/Pastry Cook. She had not gone to culinary school, and so was not an official Pastry Chef, but had started as a Food Runner and watched how the restaurant worked and asked a lot of questions. Emily says that one day, she had been pestering the chef with so many questions that he finally said, "Why don't you just come in tomorrow at 3 and I'll teach you this stuff?" Eventually she took over creating dessert recipes and executing all of Chef's ideas for new desserts and, as Garde Manger, she manned the cold side of the kitchen, preparing and plating appetizers, salads, and meat and cheese boards as well as the desserts. 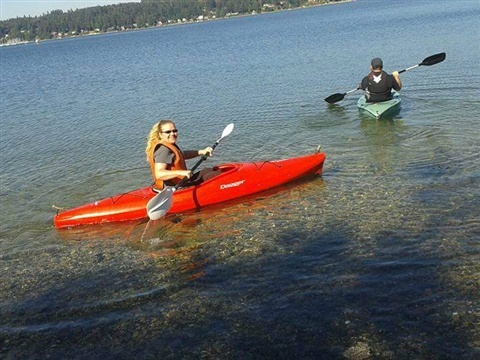 Emily is currently working as a trainer for a business in Michigan, and loves to cook for herself, friends and family. She especially enjoys baking cakes for birthdays or any occasion. She especially loves baking for her mom and dad on their birthdays, when, she says, she can thank them for everything they have done for her. 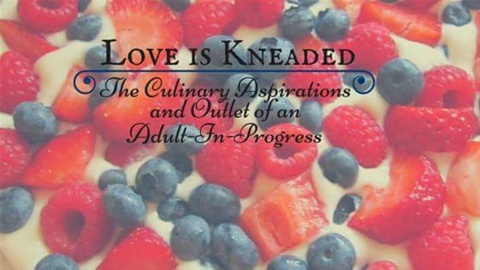 Now days, Emily writes a beautiful food blog entitled LoveisKneaded, The Culinary Aspirations and Outlet of an Adult in Progress at LoveisKneaded.wordpress.com. Emily's "quippy commentary" is fun to read and she offers recipes for many dishes, as well as fabulous desserts. The cakes, especially, look fantastic and fun to make. One aside before reading about Emily in her own words. My family and I were lucky to become close friends with her family while we lived in Ann Arbor. That included her grandparents on her father's side. These wonderful people treated my family like we were family. Mrs. Barnes taught my three children how to play the piano, and greeted them with kisses at every lesson. My children thrived with Mrs. Barnes. Once in awhile she and her husband would include us in a family Sunday dinner where Mr. Barnes (Papa) would make the most enormous, amazing meatballs. They were juicy, contained beef and veal, and we all loved them. Below you will find the recipe for these delectible meatballs, straight from Emily's blog. I encourage you to try these, as well as other recipes from Emily's blog! * I encourage to go to Emily's blog and read her comments about this dish and her grandparents. 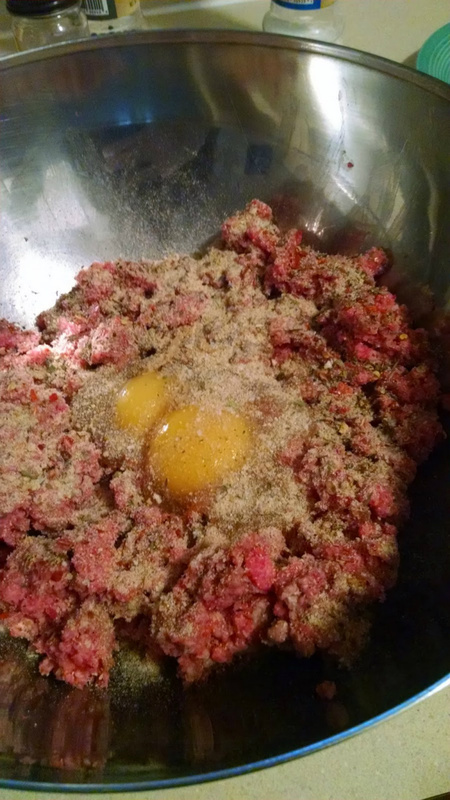 Mix meat and all ather ingredients in a large bowl with your hands. Ball mixture, creating meatballs of the size you want (they are so fun when they are bigger than usual) and place in an oiled and hot frying pan. Turn the meatballs on all sides so that they are browned all over. After they are mostly cooked, place them on a paper towel to soak-up excess grease. Emily says in her blog that she doesn't completely cook the meatballs because she likes to finish them in her own Red Sauce, which you can find the recipe for on her blog! My passion is food, specifically cooking, but I love everything related to food. Cooking, eating, smelling, looking at, learning and writing about food. I get so psyched when I come up with a new recipe or when I have a group of people to cook for. Food is all about sharing and bringing people together. My favorite thing in the world is to cook a meal for the people I love and watch them enjoy it. When I was 7, I stumbled upon the Food Network when I was flipping through a commercial break from Scooby Doo. On the screen was Ina Garten, gently folding something creamy and fluffy into dark, melted chocolate. I was mesmerized by Ina in her bright, open kitchen as she left a mousse to chill in her fridge at the perfect time for her to pull a big roast or equally impressive dinner from the oven. I never went back to watching Scooby Doo. "That" I thought, "I want to be that!" I first began cooking, or trying to, that afternoon after watching Ina Garten. I prepared "lunch" for my family by microwaving French fries and chicken nuggets and arranging them on a plastic plate. My dad chuckled at his 'lunch,'but ate the meal like it was fit for a king. I've been cooking ever since then, first helping my mom in the kitchen and then learning on my own in culinary jobs, and it's been 16 years. Cooking in general came easily to me, but I've spent time learning a lot of the special skills and sensitive recipes/ingredients. I haven't officially studied culinary skills in school, but I've been reading books, watching shows, pinning infographics, anything that can help me gain more knowledge. Diving in and working in kitchens, bakeries and even chocolate shops have given me invaluable knowledge. I have been inspired by the greats: Julia Child, Gordon Ramsay, Martha Stewart, and the food bloggers who've come before me like Adam Roberts of The Amateur Gourmet and Heidi Swanson of 101 Cookbooks. My mom's Hawaiian bread is a sweet white bread that she mixes pineapple juice into. 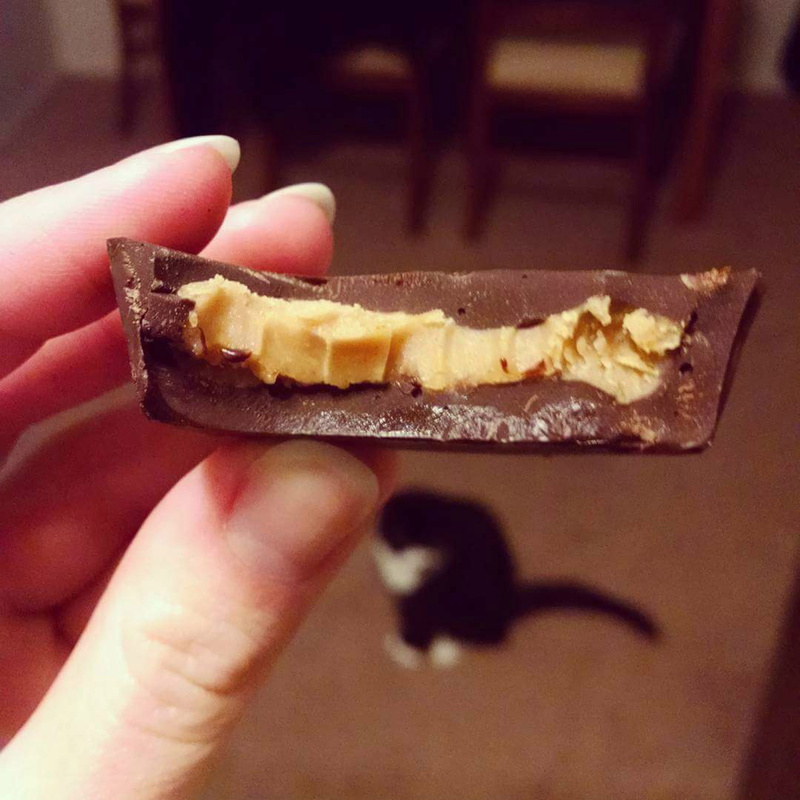 She originally baked this from a boxed mix, but after a few years she couldn't find the mix anymore. 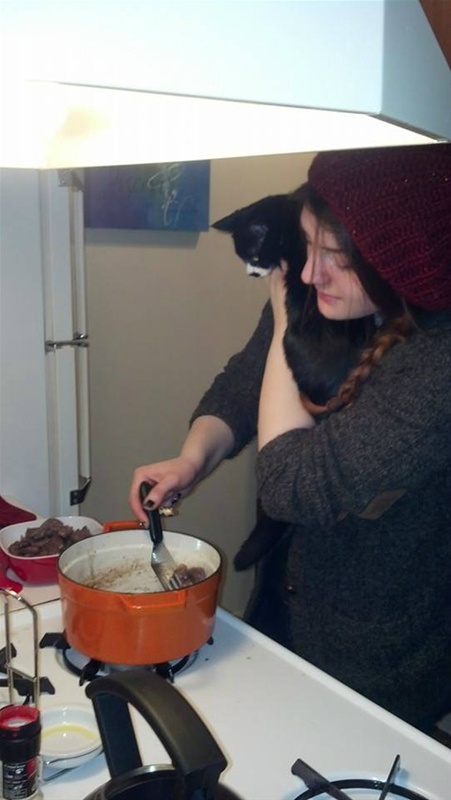 For Thanksgiving one year, she decided to try making her own and it was just as good, if not better because it was from scratch. As the bread bakes it gets a thick, crunchy crust and becomes very soft and light in the center. My mom's Hawaiian bread is always the first thing to go from the table. **Go to Best Bread in Coco's menu at the top of this page for Emily's mother's Hawaiian Bread recipe. Cooking is such a creative outlet for me, and it's a useful talent to have. Everyone needs to eat, and everyone enjoys eating well! I love that I can cook or bake something and share it with the people around me. I'm always trying to throw a dinner party or have friends over as an excuse to go overboard and cook a ton of food. I actually love cooking food for people with dietary restrictions! I'm lactose intolerant and it's been a trip figuring out what I can eat and the few ways that I can still consume dairy. I have vegan, vegetarian, gluten-free, diabetic and dieting friends. I love having them come over and challenge me! It's exciting piecing together the parts of a recipe like a puzzle, and getting to experience the end resulting in a tasty meal! I have recently redesigned by food blog, LoveIsKneaded.wordpress.com, and I'm having a ball picking new themes and layouts. I was so proud of myself when I built my own favicon! I've always loved to write, so blending these two passions for writing and food in my blog came naturally to me, and it is a great creative outlet since I work in a completely different field than my passion. I love to cook, but I have to restrain myself from eating everything! There are a lot of times when I make something and feel like it's missing something, but when I make a dish and it is totally on point, I eat like it's my job. I'm in a food coma half the time after dinner. For those readers who don't know much about cooking or want to improve their skills, I would tell them to just keep trying things. If a recipe doesn't work out the way you wanted it to, make notes and try it again. Or look up similar recipes to see what it might be needing - an herb, a larger amount of salt, etc. Use the minds around you as well! Not everyone knows how to cook well, but they know what they like to eat. If you're making a dish for a group of people, ask them what they think would make it better. I dream of opening my own bakery or owning a food truck someday, but I'd really like for my blog to take off and turn into something big. I'm doing my best to promote it and build a social media presence and make the site as awesome as it can possibly be. I'd love to be able to make a living from my blog and be able to write and cook full time. 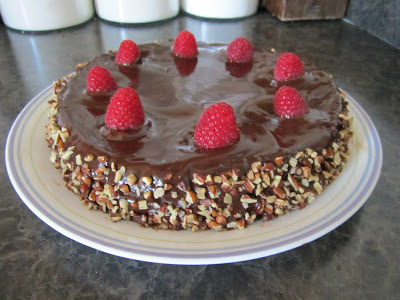 Some of the posts on my blog that I'm very proud of are 'Chicken Tacos and the Murican Dream,' 'Serendipity's Chocolate Blackout Cake,' and 'The Raspberry Sacchertorte.' 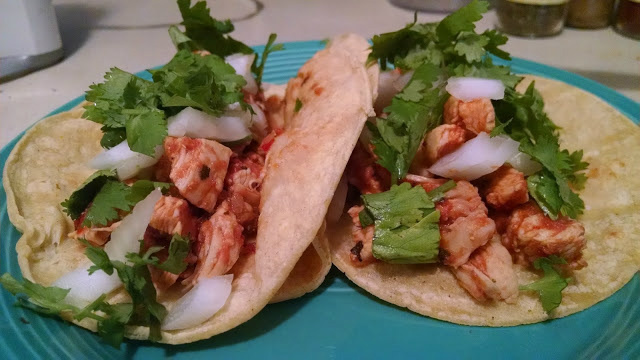 In the post on Chicken Tacos, I feel like I was really able to write from my heart and give my readers a sense of who I am and what I'm doing in my life. I'm just a twentysomething in Michigan, fighting to make rent and still make time for my passions. 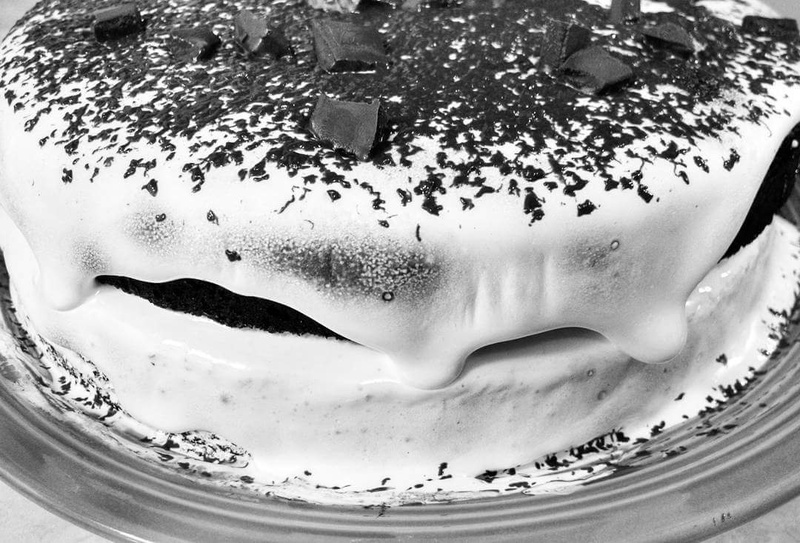 I'm proud of the Blackout Cake and the Sacchertorte because I took such care in baking each of these cakes, and the posts were specific and very helpful, from what I've heard in the comments. 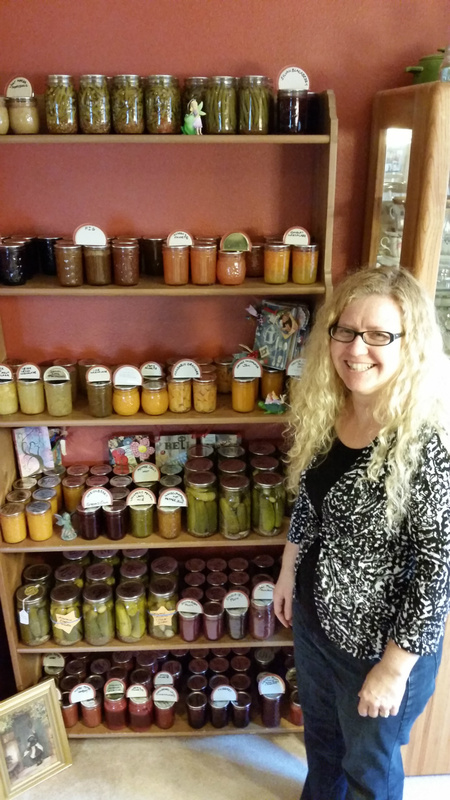 Andrea in front of one of her canning shelves. It was my first year teaching first grade at my new school. I had started the year in one room and volunteered to move across the building to another room so that a late-hire could be in the pod with our other first grade team-mates. What was I thinking? On top of the move, I had 25 plus little darlings, and they were a tough bunch. One of them was a sweet, smart, toe-headed boy who was slight of build and looked like he was just ready to be in first grade. I specifically remember having to explain to him that he shouldn't kiss his tiny blonde desk partner even if he really, really liked her. If I recall correctly, I had to remind him of this more than once. Enter his mother - Andrea. She was a parent volunteer, and the first time she came to the class to help she brought the little brother. I think he was about 3, and as cute as a button. I put him in a desk and had him do what the rest of the class was doing. And he did it pretty well. It didn't interfere with Andrea helping other kids, and I loved seeing him every week. His brother didn't seem to care, so neither did I. As the year wore on it became apparent that this mom liked coming to school and that she really liked being with her boys. I can still see her on the classroom floor with her boys during a "read-in" - one of the few parents who was able to come participate. She was always on the lookout for other children who needed help or a friend or just some attention. She talked to me like I was her friend and not just her son's teacher. At Christmas, the entire family came in before school and brought me a giant basket of homemade goodies - spicy walnuts, pickled beans, jams, and other delicious goodies. I distinctly remember making jams and jellies the following summer because Andrea's gift had reminded me that I knew how. Andrea embarassed me often. Let me explain. She praised me endlessly - to my face, to other parents, to her children, to the principal. 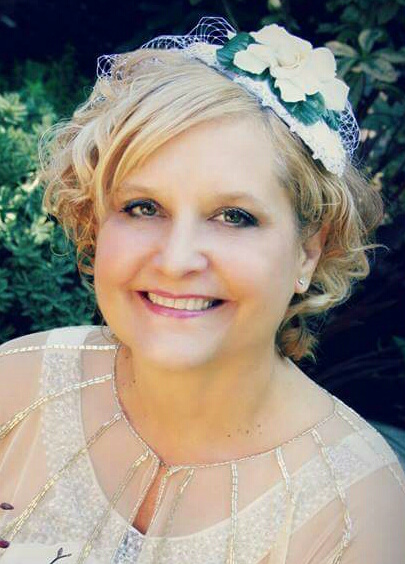 She would comment on things she saw me doing in the classroom, and talk about how she often thought "What would Mrs. G. do?" before parenting her boys at home. I never really knew how to respond. Needless to say, she made me feel good with her comments. They were sincere, and she continued supporting me through the years as I had her second son in first grade. She even came to volunteer for me when none of her children were in my class. When Andrea was around, I felt like there was a warm fuzzy blanket surrounding me. Andrea is and was friendly. She will strike up a conversation with anyone and has befriended people from all walks of life. She is interested in recycling, collecting rainwater for her garden, sewing, crafting, painting, bartering, kayaking, and currently she has become a canning guru. As her children grew we didn't see each other as much, but when we did it was as if time hadn't passed. 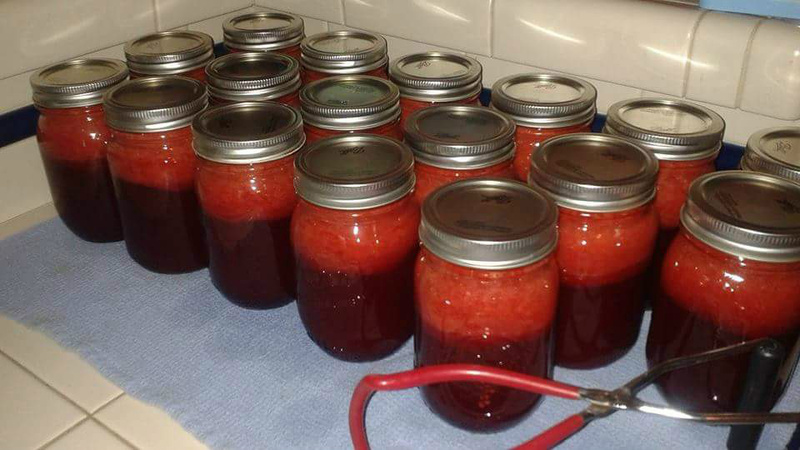 I kept track of her through Facebook and started noticing that she was posting pictures of things she was canning. Lots of pictures. Lots and lots of canning. Little did I know that she had been a home econ major in college. When I say she started doing lots of canning, I mean on a daily basis, add canning shelves to your dining room, pick your own fruits and vegetables, ruin your stovetop, get your retired dad to help you, and make up your own recipe because you are so good at it kind of canning. 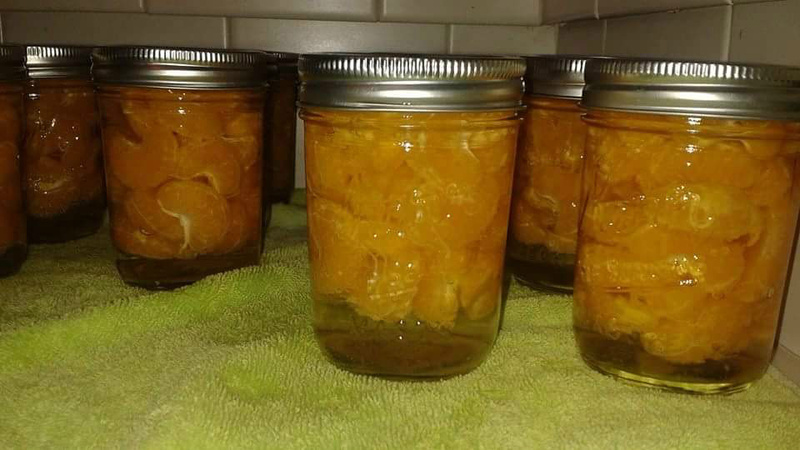 When I went to visit her last spring I personally witnessed this mini-obsession and we perused her canning shelves and I got to sample some amazing orange marmalade she had concocted. 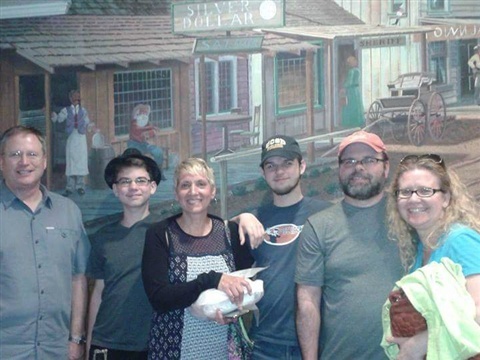 Recently, my husband and I met Andrea and her family for an original chicken dinner at Knott's Berry Farm. Andrea had brought along a jar of her boysenberry jelly so that she could have her picture taken with it in the place where boysenberries were first grown. Being a California girl, she knew the history of Walter Knott's friend, Rudolph Boyson, who was the first successful person to produce the boysenberry fruit. After dinner, I left with fond memories of Andrea and her precious family, as well as that amazing jar of jam. So, without further ado, prepare to be schooled in the art of preservation by Andrea herself. The aforementioned boysenberry jam and my favorite knife. 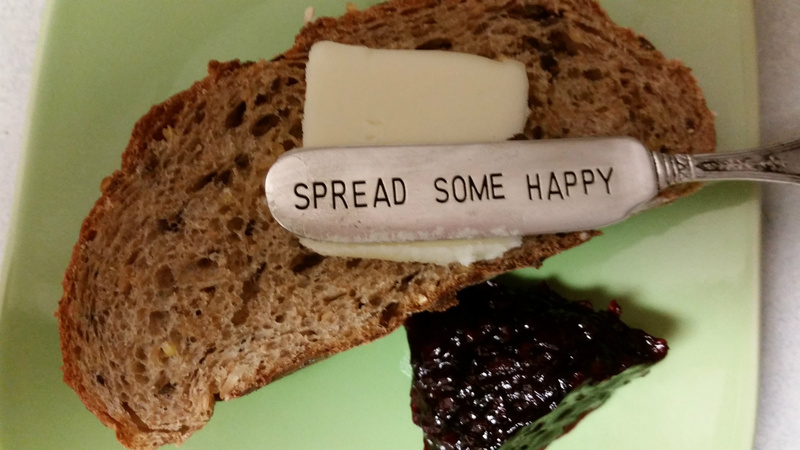 I found this knife and other cutlery items with sayings on them by a company called "Mud Pie" in a shop on Hawthorne in Portland. Winner winner chicken dinner! 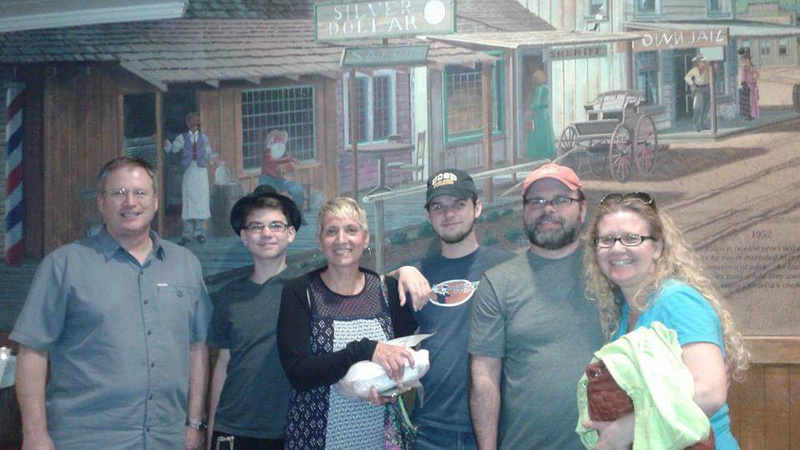 The gang at Knott's Berry Farm. 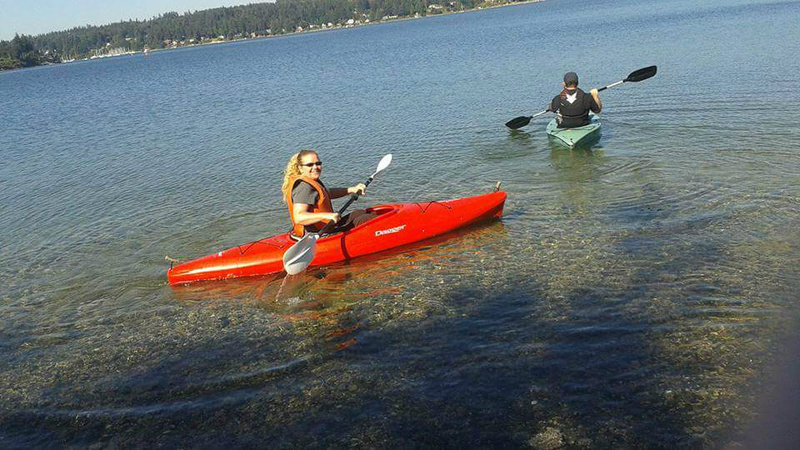 All canning and no kayaking would make Andrea a dull girl! I love canning! I am completely and totally entrhalled with it. I read books on the subject, I call the canning hotlines, I discuss the topic with whomever will listen, and I lie in bed at night on Pinterest pinning new recipes. I have always wanted to learn to can. My mother was afraid of the whole process. When she was a little girl her mother exploded a pressure canner full of spaghetti sauce all over the the kitchen. Luckily, they were not burnt, but it left an emotional scar on my mother. Perhaps her fear intrigued me. Perhaps it was the plum jam my other grandmother lovingly made for us in pint jars every year. Maybe it was the peaches my third grandmother made and gave to us with threats if we did not get her precious empty jars back to her? Why was a jar so precious? I was intrigued. In college I studied Home Economics, or what is now called Family and Consumer Sciences. Canning was not offered. I worked with my boyfriend's mother (now my mother-in-law) one summer in college to can food that I could use during the school year. She had been raised in the Mennonite Brethren and had learned from her mother. We even arranged it so that I could get college credit along with the supervision of a foods professor who received one jar of each type of canning we created so she could "grade" me. I was nervous when we started about food safety and exploding canners. We harvested everything we canned. I got to learn about my mother-in-law's childhood and met her mother and several aunts who were still canning. I was absorbed into the world of strong women who prepared, cooked, and canned nourishing food for their families with love and patience and care. I attended a Christian college, and through it all God was there. He was woven through every story. His bounty was in every jar. His blessing of our earth were being gratefully accepted and turned into canning. To this day I feel closest to God, I feel the most devoted to my family, I feel the most connected to who I am supposed to be when I can. 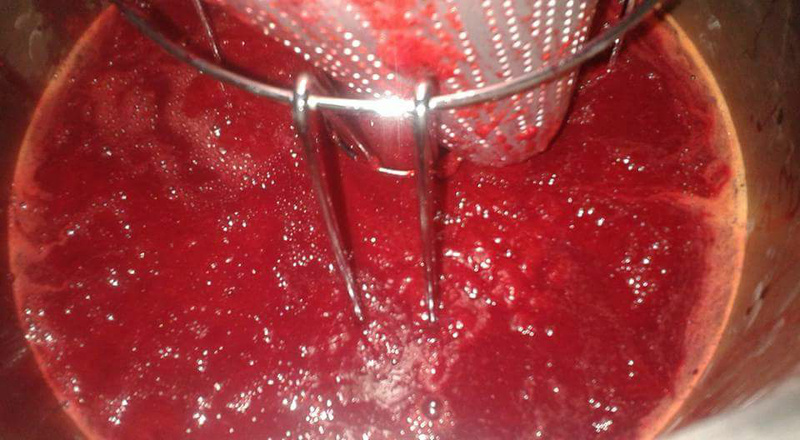 So, canning started for me in 1986 and I continued most summers since that first class with Karon. At first I only canned with her, but when my eldest was eighteen months, my neighbor gave me a jar of her homemade jam. She explained to me about the beautiful West Union Gardens farm that was nearby and how to make jam with pectin. My first solo attempt was a failed attempt at freezer jam. I know it is supposed to be the easiest, but I was a miserable failure! Later I would meet my friend Michele who taught me that the berries must be room temperature for the freezer jam to work. But freezer jam is a nuisance! It takes up room in your freezer. The containers are bulky and breakable, and everybody made it. Canning jam, now, that was more unique and something I could try. 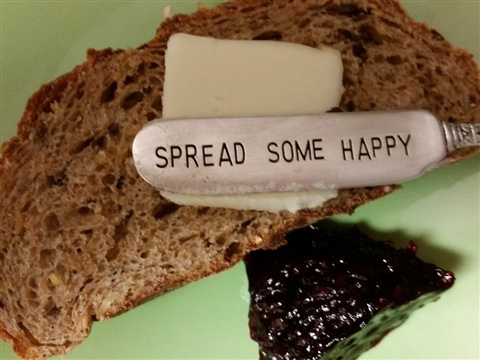 I was determined my family would never again eat store bought jam. Mine was better. Mine was healthier. My nieces and nephew were very into peanut butter and jelly sandwiches so I was very, very busy. Mandarin oranges without all the sugar! Rory and the toe head. As I gained my confidence, I also gained a friend named Rory. 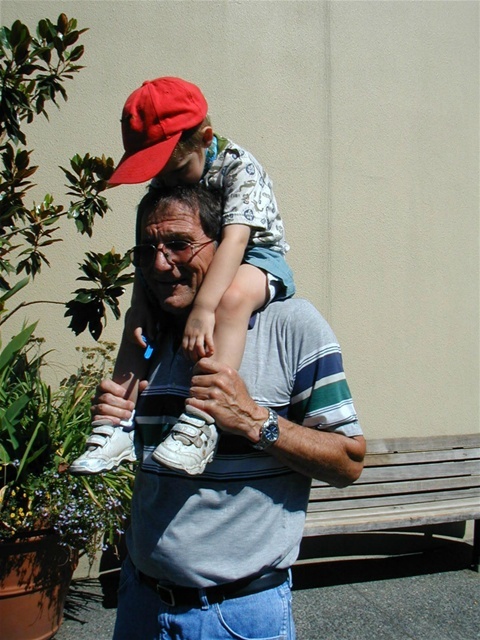 He was a kind gentleman about twenty years my senior. He was retired on disability and looking for things to spend time on. He had canned with his wife when they were married, and now he canned with me. He was my best friend. He was my husband's bestfriend. He was my kids' best friend. He was a daily part of our lives. His daughter lives here and his son lives in the tri-cities. He would visit his son, who had contacts with local farmers, and he would bring back cases of free to cheap produce. We would can. Rory died of emphysema. At his funeral I was sitting with my in-laws and my parents when my Dad sadly said, "Well, who is going to can with Andrea now?" You know in the movies where everyone takes a step back and the poor sucker who didn't is left standing in front as the volunteer? Well, as soon as Dad asked the question all of the other parents quickly and wisely looked down into their laps. My father looked around, saw that he was the poor sucker with his head still up and said, "Well, I guess that would be me." I've been canning with my father ever since. Every Wednesday Dad and I meet at our favorite Thai restaurant for lunch. Then we head to the farm or to my house where the produce has been prepped and we can. We call it "Daddy-Daughter Day" and we both love it! My Dad was a cook in the Coast Guard, so he caught on quickly to canning. He has even improved the process and made it so much easier. To warm the jars we put them in the clean dishwasher on a hot rinse cycle. 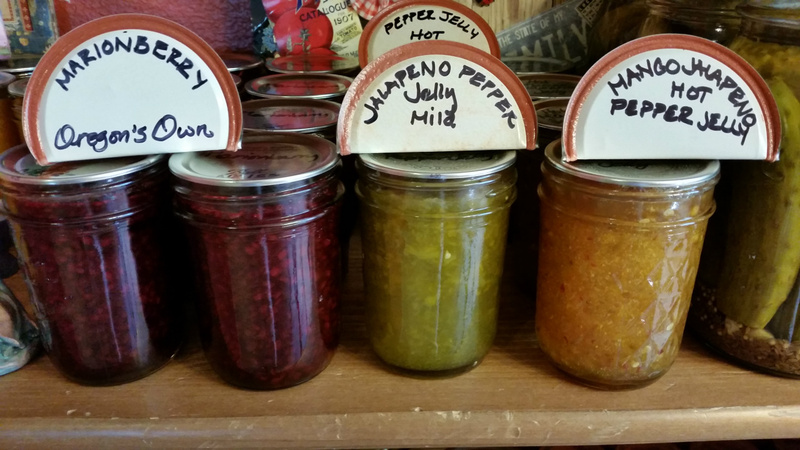 This keeps the jars hot and ready to go, and out of the way. To dry the rings he suggested we put them in the oven on the lowest setting for twenty minutes, and they come out dry and with no rust! He's quite clever at joining into the process and improving it. I am very proud of him. Andalusion plums from a dear friend's tree who lives on the street of that name. I love the Home Preservation (Extension) hotline. Any recipe I create I run past them to make sure it is safe. I also love the Ball Blue Book of Canning. I also use other books such as Preserving By the Pint, and Food in Jars, both by Marisa McClellan. For someone who wants to learn to can, I say find a teacher. Give them free help and learn in the process. I always say "No" when people ask to learn from me. Those who really want to learn will ask me themselves and ask a few times. It is these eager students I will teach. When you are ready to strike out on your own, choose an easy water bath recipe to start. Self-peeling peaches or jam are a good start. 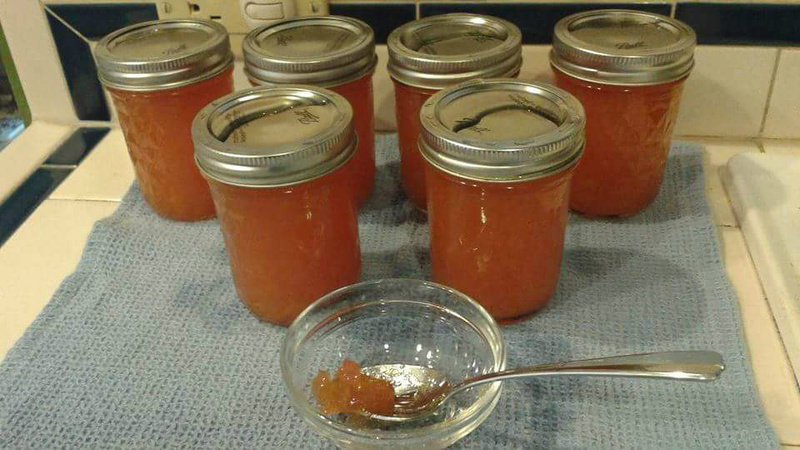 Applesauce can be a good first try especially if you have an apple tree. Keep the 800 number for your local extension close by and follow their rules. Follow a Ball Blue Book recipe precisely as stated. If you have a recipe from Grandma, call the extension number so they can help you with how to safely make the recipe with today's produce, or direct you to something similar that is safe. Remember Grandma was canning produce with different micro organisims than you are canning now. 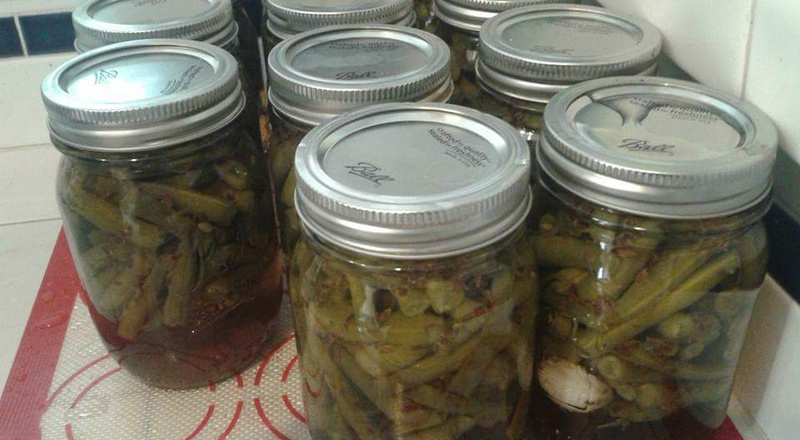 Heck, I am canning differently that I did when I started. Safety is the most important. You don't have to be crazy for canning like I am to enjoy it. 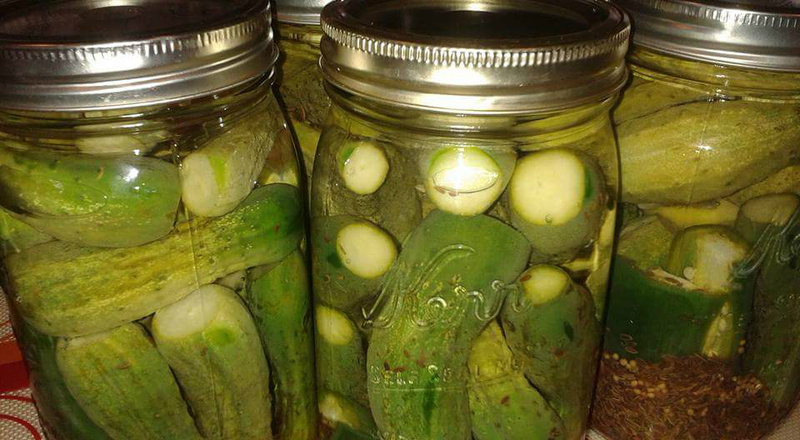 Canning is an art we should not lose. It is not very expensive to get started, and it makes wonderful gifts. Give it a try. You might just surprise yourself and make those around you feel loved in the process. I live and breathe canning. I try to only speak three sentences on the topic to non-canners. The wild look in my eye, and my constant run-on sentences exicitedly spewing forth from my soul can be overwhelming to some! I hope to work for the Food Bank assisting or teaching in their canning classes one day when I am suffering empty-nest syndrome. My ultimate goal would be to be laughing in heaven and canning with God, but that is a goal I don't intend to fulfill for a long, long, long time. Bennie seems confused by his portrait. Denice Palanuk Wilson and I went to high school together. She was older than I but we were involved in several activities together. She was an athlete and we were in student government together. I remember always thinking that Denice had an awesome smile, was an enthusiastic person, and that she was really nice. She actually paid attention and was friendly to lower-classmen like me. I had not seen Denice since leaving high school until a few years back at her cousin's wedding. My daughter and I were seated at the same table as Denice and her sister during the reception. We exchanged old memories, I got to tell her how much I had admired her during high school, and I learned that her husband had passed away and that her son actually lived down the street from me. Denice was as friendly as ever and we became Facebook friends. For the next couple of years and until present day, I watched Denice's posts. She was painting and periodically posted her efforts. She married a great guy named Rick and I could tell that she was very happy from the things she shared on Facebook. I also began to notice that she was getting quite prolific at painting, and that her art was becoming continually more refined and the subjects varied a great deal. 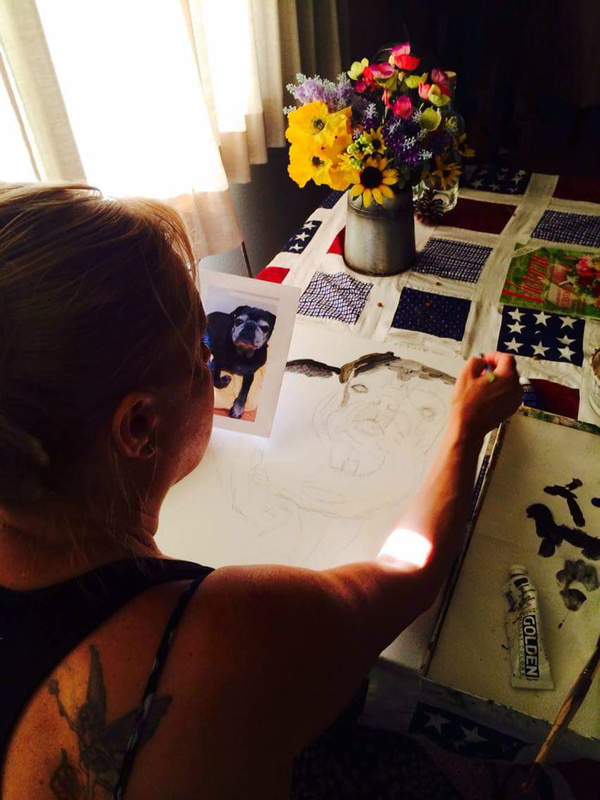 I especially became interested in her depictions of animals. I just happen to have two handsome animals - my dogs Bennie and Riley. 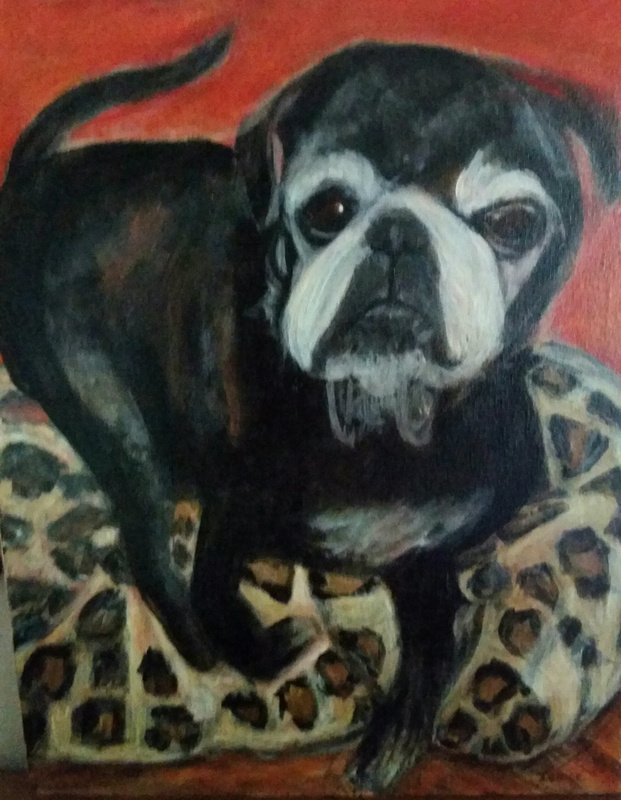 Since seeing my sister's painted portraits of her puppies done years ago, I have always wanted some of my own. I contacted Denice, sent her some pictures of Bennie, discussed what we both envisioned, and she began. 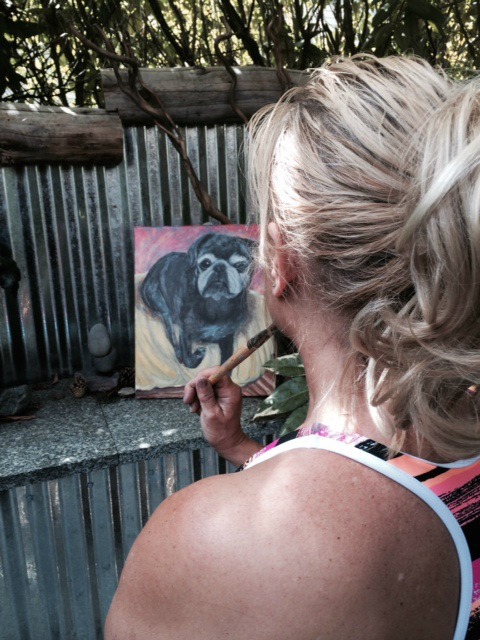 I was so impressed by her willingness to tweak her work after I decided that I wanted a few more details added. 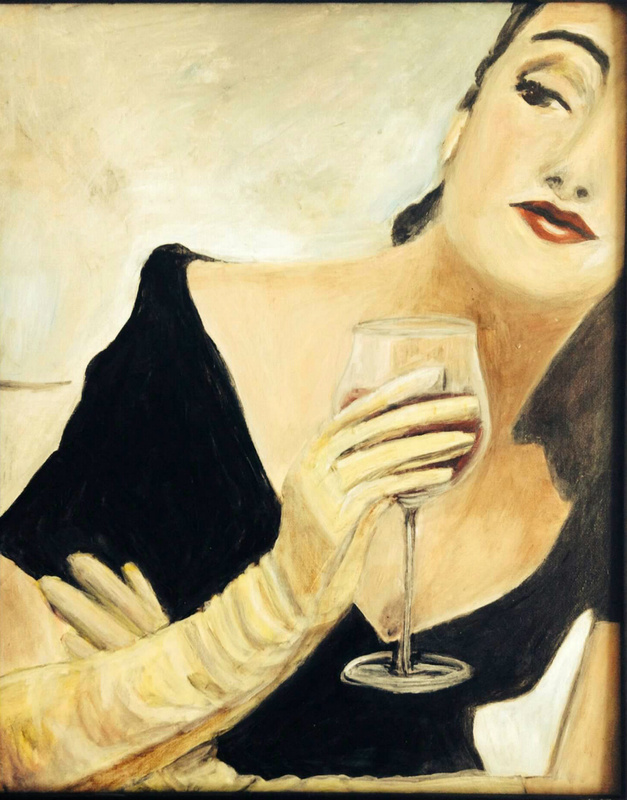 I am now the proud owner of a Denice Palanuk Wilson original! 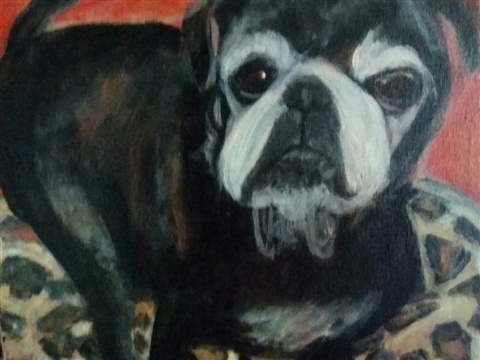 I think that Denice truly captured Bennie's essence, especially in his eyes. It will proudly hold a place of honor in our home, alongside the portrait of Riley that is soon to come! 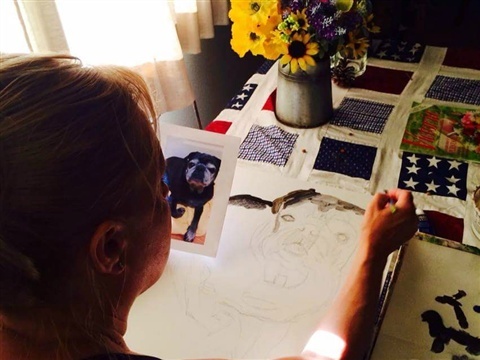 Below you will find an interview with Denice about her painting passion and learn how to view her work and commission your own painting. 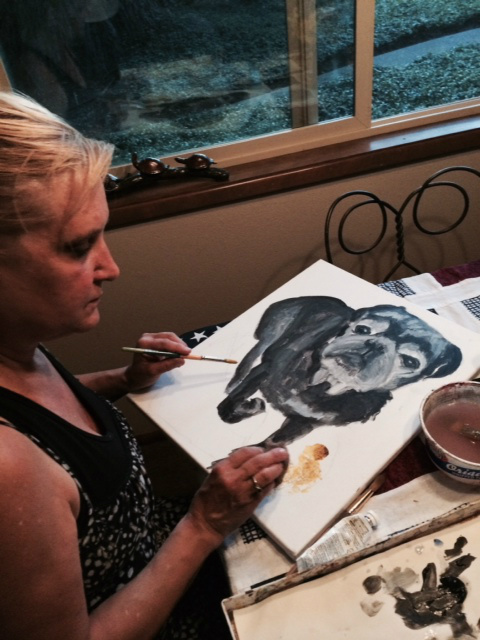 Denice draws and begins painting Bennie. A first "step-back" look at the portrait. 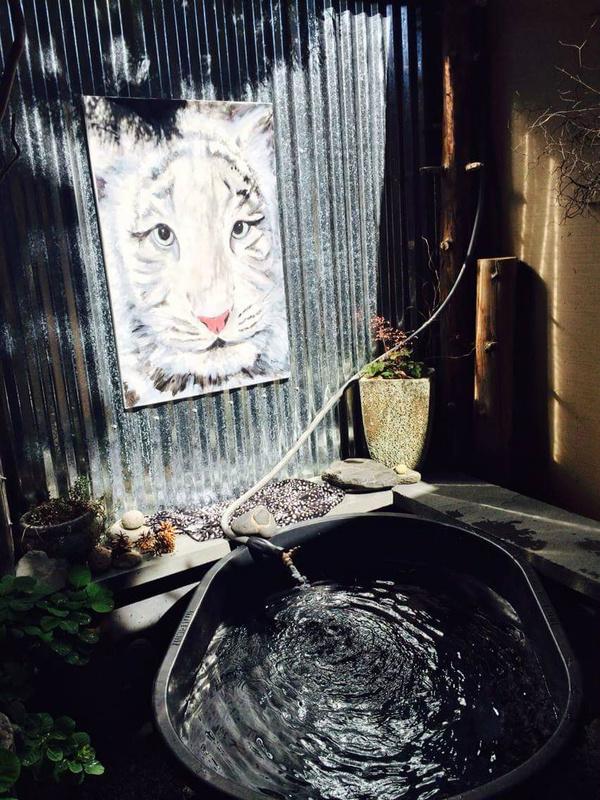 The completed painting after adding printed blanket and a tail. "I'd like to be well-known during my lifetime, not after my death!" 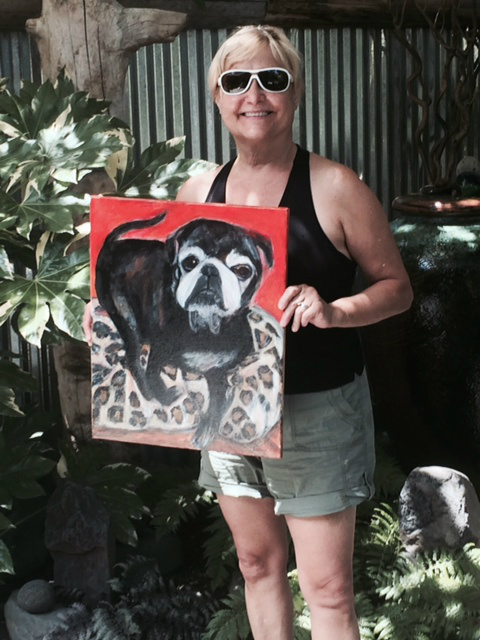 My current passion is creating paintings for myself and others and teaching art classes. I've always had the desire to produce art and push myself to create like the old masters. It brings me joy to escape into the world of color and create my own images. I am more right-brained and creative, and started drawing in grade school. I loved when the Art Literacy teacher came to our class and I first was introduced to art history. I even taught art literacy in my son's classes from 1st-6th grade. It gave me great joy to keep art alive in the classroom and watch the children create their own artwork. I took art classes throughout school; drawing, oil and watercolor painting. I first learned to draw, mostly black and white drawings; later learned about the color wheel and mixing and shading colors. I loved my Fashion Design classes at OSU and had an art professor there who encouraged me to not dwell on a piece and to train your eye by creating many pieces. 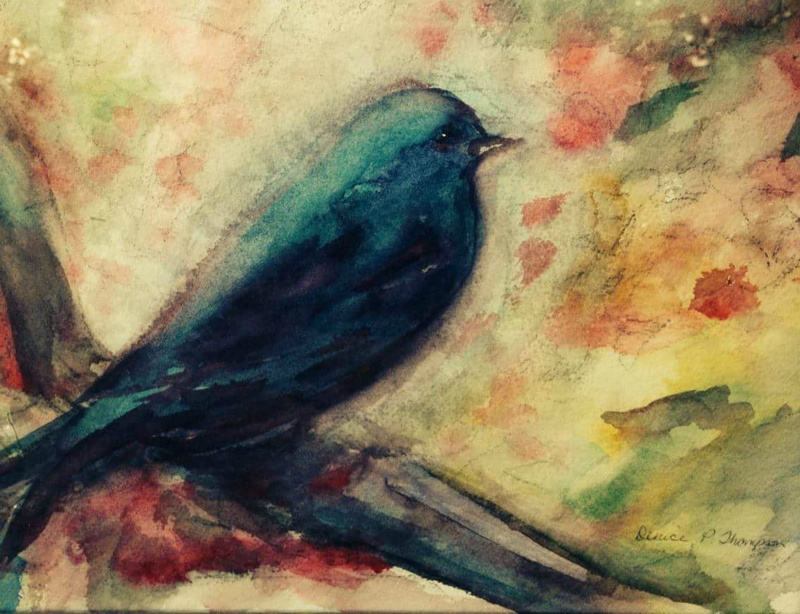 Currently I am teaching art classes at my home and at Rags to Ritches, a consignment shop in Salem. 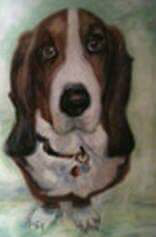 I seem to always have a piece that I've been commissioned to paint; mostly pet portraits. 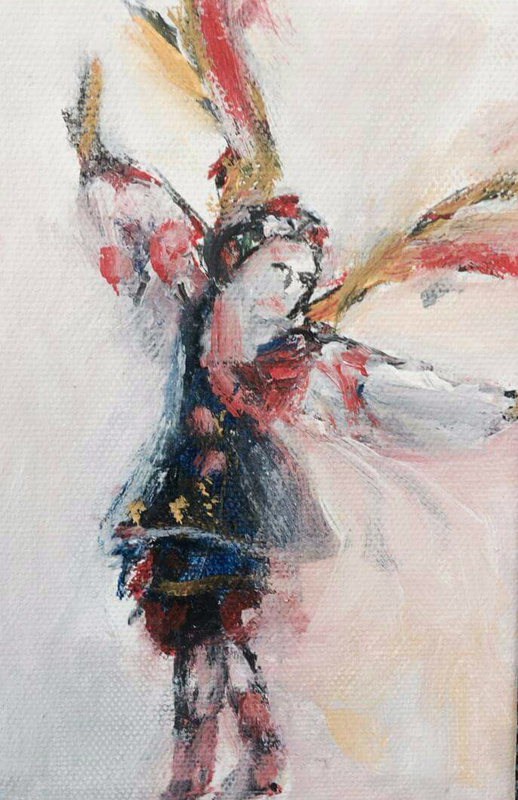 I also have art for sale at Gango Editions and FineArtAmerica online. Through FineArtAmerica patrons can have my images reproduced onto pillows, duvet covers, bookbags, and made into posters and other items. 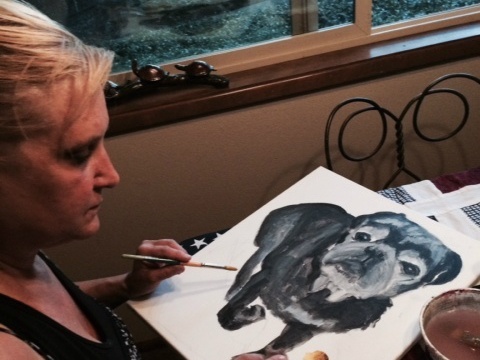 Search in the website's browser for Denice Wilson, click on her picture, and her paintings will come up. I love how it makes me feel to reproduce what I see and put my own style to the canvas. 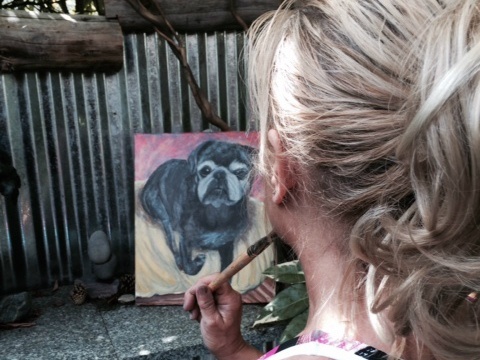 I have a diverse range of subjects that I paint. I've traveled to over 20 countries in Europe and also enjoy camping and I have an appreciation for nature. I find a picture that inspires me, I draw it onto a canvas, and then turn on classical music and sit down and watch it come alive with paint. It becomes a spiritual experience as I watch it unfold. It can take me a few hours, a few days, or a few months to complete. It is a process. 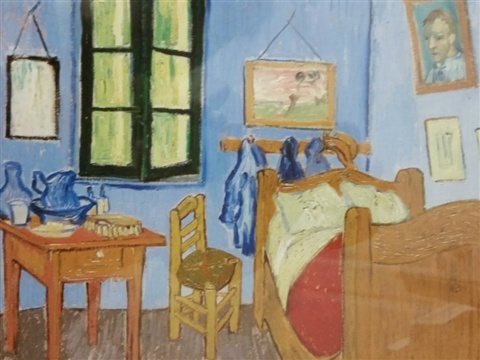 Bedroom in Arles Vincent van Gogh "I felt like Van Gogh, living with his brother and producing works of art." I was inspired to paint to release my pent up emotions after I lost my job, sold my home and my son moved out. 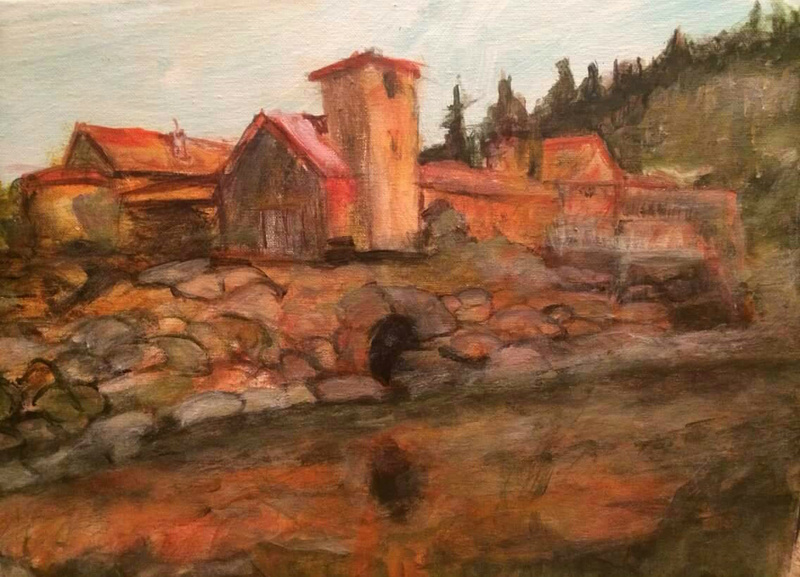 I was still struggling with the death of my husband and by moving in with my brother's family I found I had the time and the passion to start painting. I really released my emotions and feelings and had a wonderful time creating. 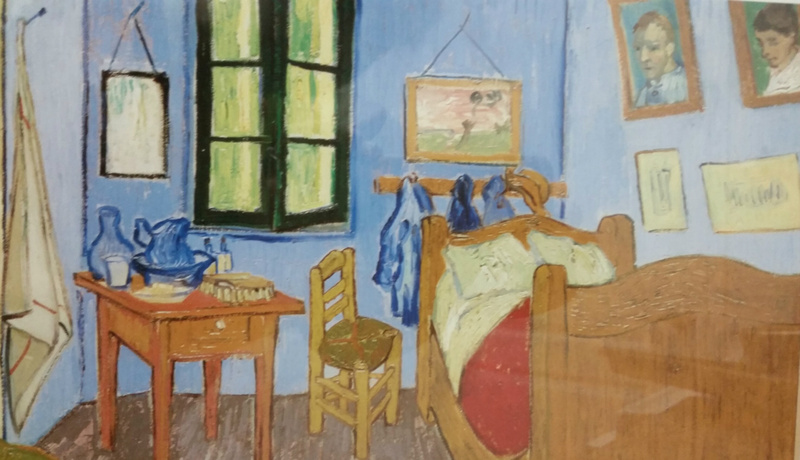 I felt like Van Gogh, living with his brother and producing works of art. 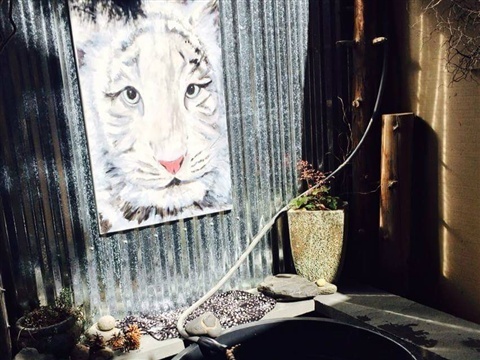 My husband Rick and I are creating an art space and Zen garden for us to enjoy in our backyard. I hope to teach classes, have studio art sales, and get my art out into the world. Rick has a creative eye for detail and supports me. After all these years , it's so nice to be a team. 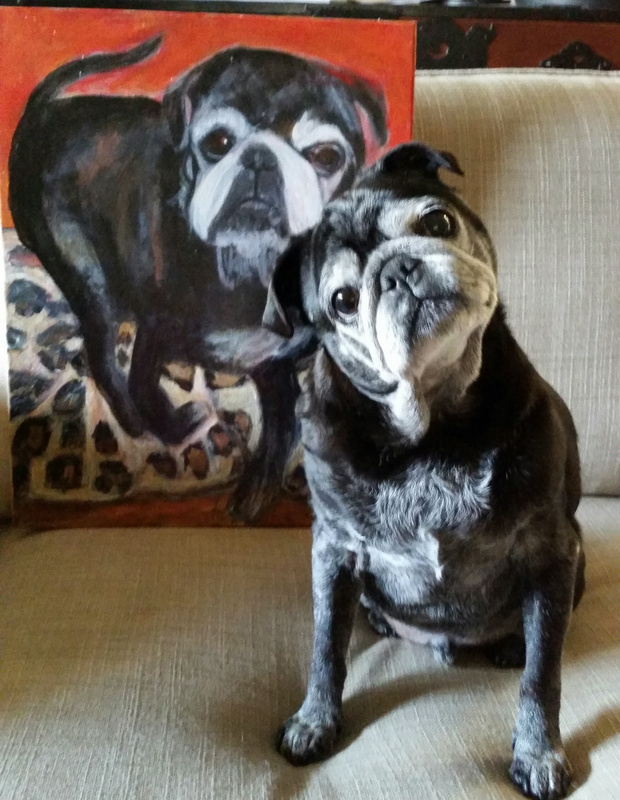 Denice with completed portrait of Bennie. Take a class from someone who you like as a person or from someone whose style of art you like. Enjoy yourself, art is fun! Not every piece can be a masterpiece and it's fun to see what other people in your classes do and what their styles are. Plus, you can make new friends and the conversations are entertaining! I prefer painting with acrylic paint because it is more forgiving, it dries faster than oil, doesn't smell, and I can layer and change things. I love watercolor but it takes a more precise and planned-out manner.